Compatible with HCs and Subcritical CO2. The combination of innovative technology and superior design and manufacturing make Temprite coalescent oil separators the most energy-efficient separators available. Temprite coalescent oil separators separate and clean oil at a nominal 98.5%+ efficiency level. All Temprite coalescent oil separators are equipped with the Temprite Standard Filter. The Standard Filter uses a matrix-type borosilicate glass fiber material to do the work formerly done by impingement screens in conventional oil separators. Illustration #1 shows how a coalescent oil separator moves oil-laden refrigerant gas into the filter and through the separator. Refrigerant mass flow pressure moves the aerosolized oil into the separator. Oil droplets separate from the refrigerant gas flow as they enter the filter, where the oil is stripped from the refrigerant gas. These larger, heavier droplets accumulate at the edge of the filter and then fall into the Wet Zone, collecting at the bottom of the separator where the clean oil is returned to the compressor. The clean refrigerant gas (Dry Zone) moves upward through the separator and back to the condenser. Illustration #2 shows a cross-section of a Temprite Standard Filter. System pressure moves the refrigerant oil in aerosol form outward from the center of the filter. The filter’s borosilicate fiber matrix causes the aerosolized oil to vibrate and collide with other oil molecules, creating bigger oil droplets. 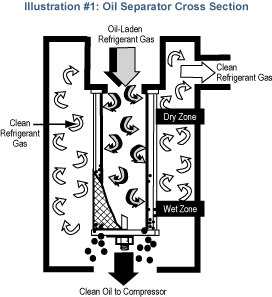 As the oil droplets are pushed to the outer edges of the filter by refrigerant flow, the accumulated droplets fall to the bottom of the separator through gravitational setting. 1 µm in size. When evaluating the efficiency of your current separator, compare the micron cleaning range of your separator to Temprite coalescent oil separators. Two of the biggest energy drains on any refrigeration system are dirt and contaminants and excess refrigerant oil. In addition, the new refrigerants coming onto the market have an enhanced solvent effect, meaning more contaminants than ever can be clogging your system. 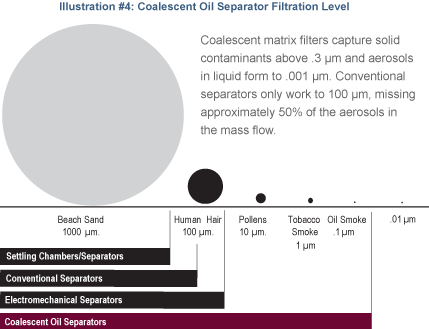 Illustration #4 compares the filtration levels of all other types of separators to coalescent oil separators. 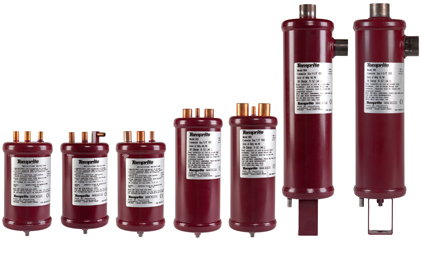 Temprite filtration gives you the cleanest possible oil and refrigerant gas — the keys to energy efficiency, lower carbon emissions and longer compressor life.